The Los Angeles Lakers are in the middle of a six-game road trip as they visit the Indiana Pacers in a fight with the Clippers for the No. 8 seed in the ​Western Conference. 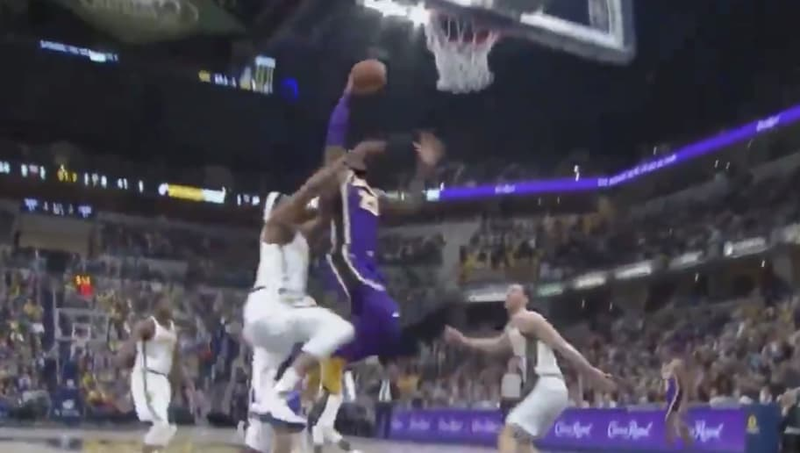 And late in the third quarter, LeBron James flew into the paint and blew past Indiana's Myles Turner for a one-handed slam that said a whole lot without the need for words. Well, it looks like all of that​ load management worked for LeBron. While the score isn't close, seeing LBJ move that quickly with such power shows that he is healthy and thriving after suffering a groin injury on Christmas Day. A loss tonight would drop the Lakers record to ​27-27 and would be their sixth loss in the last eight games. Los Angeles is in desperate need of help if they want to make the playoffs this season, which could add more juice to the​ Anthony Davis trade talks. Next up for Los Angeles is their age-old rivals, the Boston Celtics, on Thursday night, followed by the Philadelphia 76ers on Sunday afternoon. No, it simply does not get any easier.